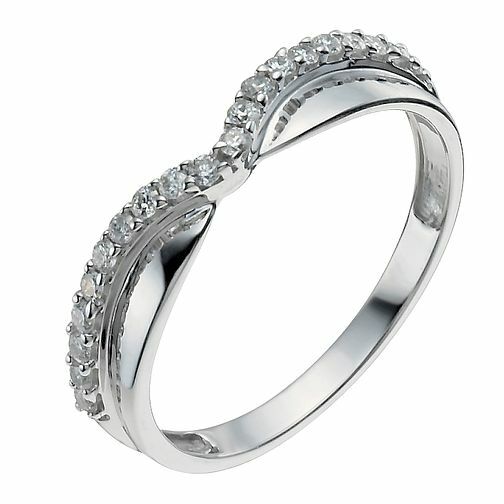 A polished 9ct white gold ring, adorned with a sweetheart-shaped row of glittering diamonds. Contemporary simplicity to be worn for all occasions. 9ct White Gold Shaped One Fifth Carat Diamond Ring is rated 4.3 out of 5 by 4. Rated 4 out of 5 by Anonymous from Great fit We purchased this ring as my wedding band. It matches upto my engagement ring perfectly which was very hard to do as I had designed it myself and had it made. The only issue I have is that the back of the band has worn quickly so is now a yellow gold colour. Rated 3 out of 5 by Anonymous from Perfect t for our needs, and really suits the engagement ring. Sits very well in the finger and marries with the engagement ring excellently. The staff in the Milton Keynes branch were friendly, helpful and not pushy allowing us to make our own decisions.